We are back to Japan, having arrived late last week for a 3-1/2 month stay. 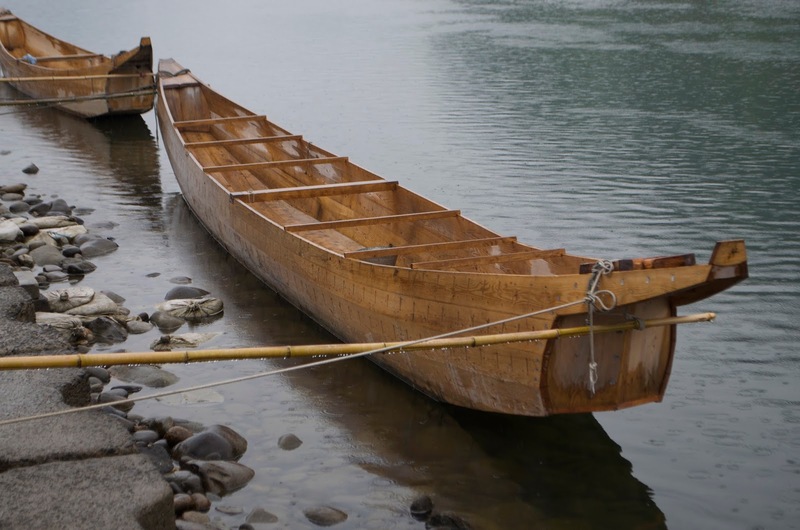 I will be building two boats for two different institutions, plus we will be taking a research trip to Taiwan to look at indigenous boats of the Yami people of Lanyu Island. I plan to blog extensively throughout this period so stay tuned. 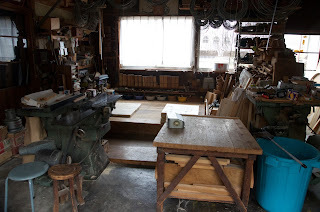 Our first weekend, however, we went to Gifu City to meet with the last builder of the iconic cormorant fishing boat. The meeting was to discuss my apprenticing with him sometime in the coming year. 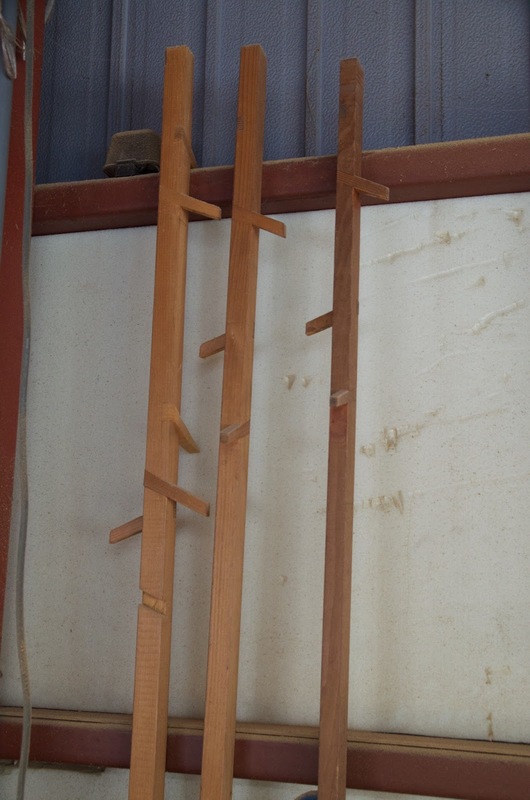 He has commissions right now for two boats, having delivered a boat last year. 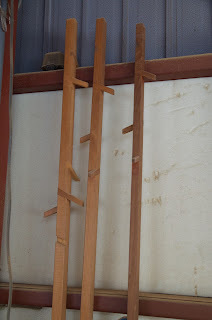 There are nine cormorant fishermen in Gifu City and the boats last about 10-15 years. Right now there is a cycle of fishermen getting new boats. 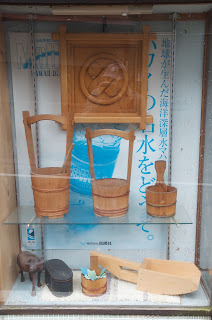 This work is crucial, because Tajiri san works entirely from memory, aided by various patterns only he understands. He has never had an apprentice and so its crucial that his design and techniques be documented if this craft is to survive. I first met Tajiri's master Nasu san back in the 1990s and I tried to apprentice with him, but he became too ill to work. Tajiri had apprenticed with Nasu right out of high school but then gone off and become a bathtub and bucket maker like his father. With Nasu san's retirement decades later Tajiri san came back to build boats. 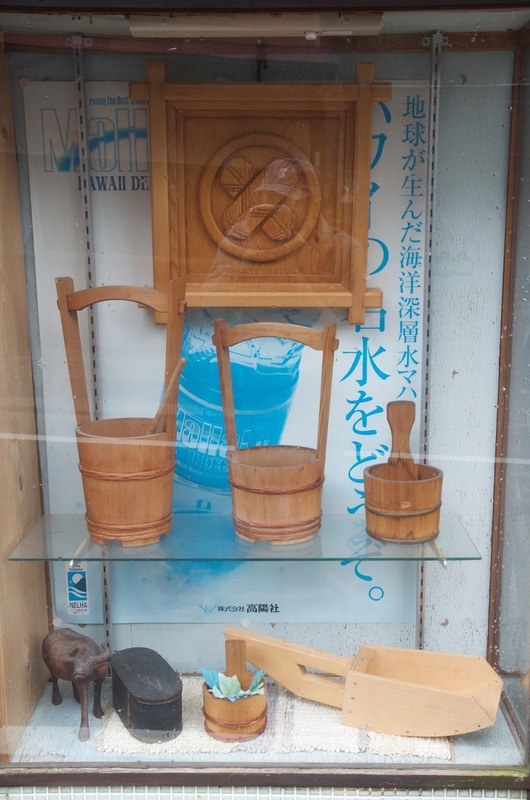 A showcase outside his bathtub workshop, showing buckets and a bailer. 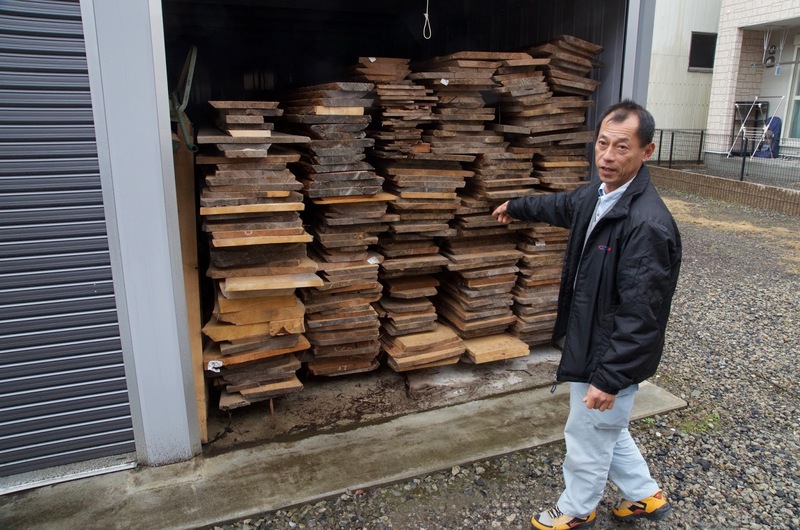 Tajiri showing us his lumber storage. He has four garage bays like this one packed full of wood, mostly maki, a local type of pine used for boats here. 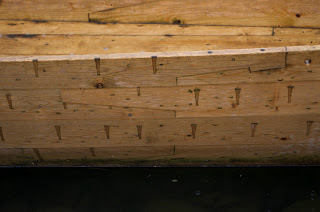 To my knowledge cormorant boats are the only ones in Japan that use the kasakugi, or umbrella nail. 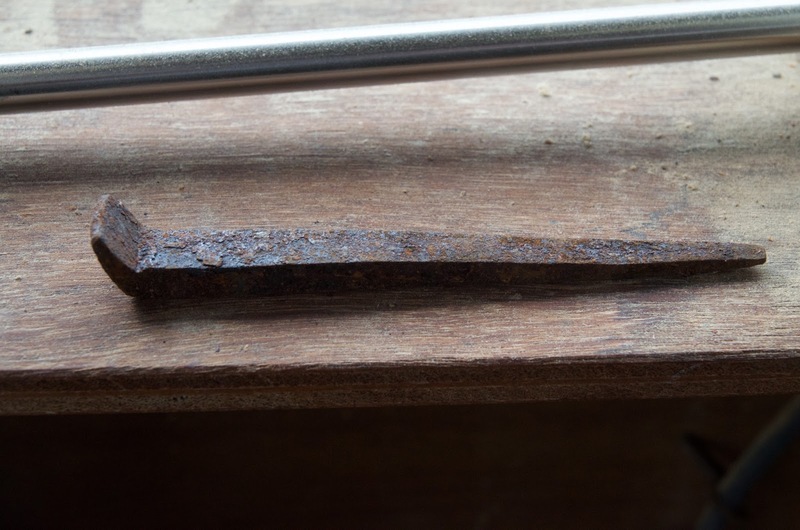 The head is angled and the shank is a tapered square. 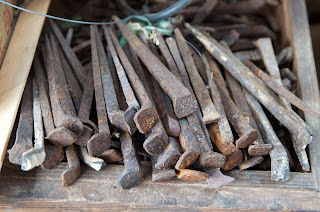 When I saw the rust on these nails I assumed Tajiri san pulled them out of an old boat. 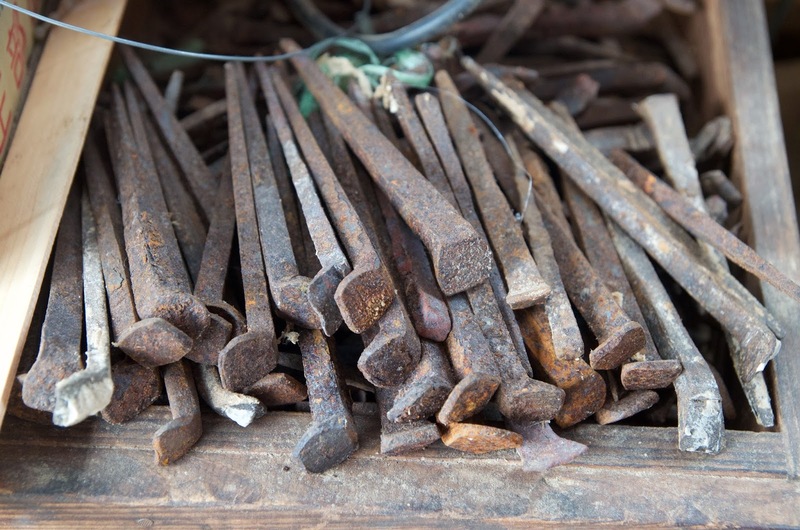 Years ago Nasu san told me he was forced to start recycling nails from derelict boats after his blacksmith retired. But Tajiri san soaks his nails in brine because he feels a coating of rust gives them better holding power. He's the second boatbuilder in Japan to tell me this. 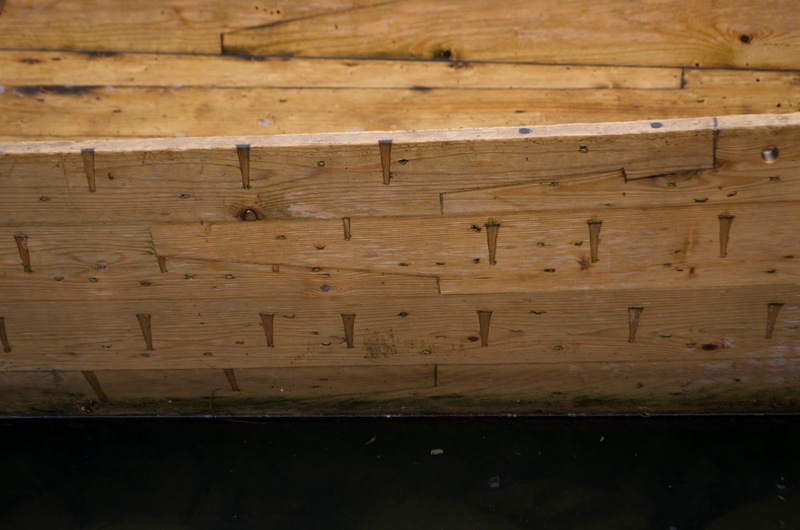 Tajiri san's patterns for building boats. 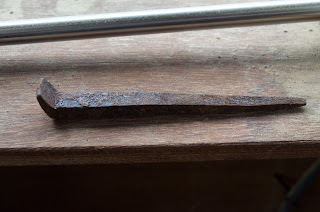 A close-up of the scarf joints in the side planking and the closely spaced edge nails joining the planking. Tajiri san's most recent boat. I will soon get word on a research grant to work with Tajiri and then it will depend on meeting his building schedule. The work would take two months, he says. Like all my teachers he insists one must study for years to master building these boats. I sincerely appreciate the value of the apprentice system but there's no way we can afford to replicate the old ways of learning; documenting the craft as completely as we can is what we have to do. Tajiri san spent three years studying with Nasu san, then two more years working for him as his unpaid assistant.